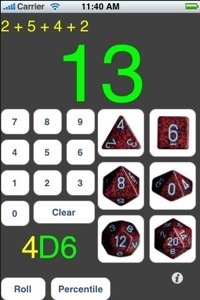 The Killer App for the iPhone . . .
. . . is, of course, this polyhedral dice roller that the bloggers at Infinite Lives discovered. Author Brian CarnellPosted on July 24, 2008 Categories UncategorizedTags Dice, iPhone, Role Playing GamesLeave a comment on The Killer App for the iPhone . . .